In this edition of our Sound Like series, Matt and Rabea seek out the ground-breaking tone of rock heavyweight Pete Townshend on a budget of £1500! Pete Townshend is widely regarded as rock royalty. His bold, cutting-edge sound and wild on-stage antics captured the imagination of a generation, giving birth to an entire subculture and cementing him as one of the most important names in UK music history. It’s only fitting therefore that we’ve featured him in our Sounds Like series! Our resident tone wizards Matt and Rabea decided to try and emulate his diverse but iconic guitar tone, giving themselves a budget of £1500 – but how do you emulate the tone of someone whose band has created 11 studio albums over a 5-decade period, during which guitar and music technology has changed almost immeasurably? Townshend is known for playing countless instruments from the likes of Gibson, Rickenbacker, Fender, Gretsch, Hiwatt, Marshall and more – how’s that for diverse? As we’ve already mentioned, Townshend has used a wealth of different guitar brands and models during his time, but he’s currently using a modded version of a Fender Eric Clapton Stratocaster. The mods include Lace Sensor pickups (better sustain, less noise), a Fishman Piezo-loaded bridge with a dedicated volume control (for acoustic-esque resonance) and an EMG-preamp to boost the Piezo sound. His tone is known for having great mid/high-end presence that cuts through the mix with ease. This time round, Matt & Rabea chose a Fender Standard 50s Classic Player Strat, and for a number of reasons. At £782, it leaves plenty of room for their budget. The electronics of this particular edition are Custom Shop-designed low-output pickups. This reportedly means less noise and a brighter tone, very similar to Townshend’s Lace Sensor pickups. The pickups combined with the Alder body and Maple neck make this a typically versatile Strat, ideal for covering Townshend’s vast tonal range! Despite famously pioneering the design of the Marshall Half-Stack, Townshend now uses Fender Vibro-King combos & extension cabinets, but for good reason. The Vibro-King amps are renowned for their enormous capacity for high volume, a staple of Townshend’s live performances. His long-time guitar tech, Alan Rogan, said in an interview that he only has the volume at around 3 for his on-stage amps – if that’s loud enough for Pete Townshend, it’ll be loud enough for anyone else! Matt & Rabea settled for a Limited-Edition Tweed Fender Blues Junior combo. This was chosen because it delivers full-bodied valve-powered tone, 15W of capacity, and a 12” Jensen speaker, known for handling high volumes. Not only that, but it comes in at £539, putting it well within reach of their budget! As we’re sure you can tell from the video, it boasts an incredibly punchy and bright sound that copes really well at high volumes – perfect! Townshend is known for using a Boss OD-1 to push his amps a little harder – it gives him the perfect amount of grit to project and cut through the mix while retaining an old-school sound for some of The Who’s classics. Matt and Rabea went for an OD-3, the closest and most affordable equivalent, but noted that it can be particularly tricky to emulate old-school studio tones. This is largely due to the massive difference in recording quality – otherwise bright guitar tones may sound muddied, or even the opposite, in that full-bodied punchy tones might sound tinny. Our tone wizards ironically found that the Mexican Strat & Blues Junior combination was a little too bright (even for Townshend’s tone! ), so they used the OD-3 to widen the tone and smooth over some of the harsher frequencies, adding a nice amount of crisp at the same time. To allow for a little more tonal legroom, they also went for a Dunlop Hendrix Fuzzface Mini (Band Of Gypsys Edition) and an MXR Dyna Comp Mini; the fuzz allowed them to mimic Townshend’s signature ‘buzz saw’ sound that featured on The Who’s earliest recordings right up until their latest live performances. The Dyna Comp Mini contributed further to ‘taming’ the high-end of the rig, evening out the volume a little more and giving it a little added punch similar to Townshend’s EMG-powered Piezo Strat. Do you think Rabea & Matt got close to the Pete Townshend sound? Leave a comment below and share your thoughts! Matt: And this is 'Sound Like' on Andertons TV. Matt: Today we're going to be sounding like Pete Towshend of The Who. Matt: Obviously, Pete Townshend is massively famous - one of those big, big guitar guys from back in the day. Rabea: Do you know why - the one thing, apart from obviously being the guitarist from The Who, one of the things I know about him the most is that he had quite a large part in the early developments of Marshall amplifiers. Also, he was, I think, one of the very few people to order an 8x12 [cab] because it wasn't loud enough and he wanted it to go louder, so Marshall made him an 8x12 [cab]. Matt: He also invented the windmill arm thing, didn't he? Rabea: Oh, the [imitating guitar sound while swinging arm in circular motion]. Matt: Famously, yes. That was all him, so he's got a lot speak for. Rabea: He's residing at Fender Strats these days, right? Matt: Yes, apparently since the '80s he has a Strat and uses Fender amps more easily, but has Marshall, Hiwatt - all sorts of stuff. Rabea: Well, it's a good job that Andertons stock Fender gear! Matt: -what we can find. Matt: ...we found something cool. Rabea: We did find something. What's better than one? Rabea: This is an OLP double neck. I saw it and was like, "I have to pick it up at least to see what it feels like." Matt: The 12 string and six string. Rabea: I know. When you don't need one, you should definitely need two. See that? This, was my first guitar. Rabea: Not this actual one but this exact model, this exact finish. Everything about this was my first. This is a Washburn X50. I got this for my 16th Christmas. Rabea: My Christmas when I was 16, and yes, that's quite cool. Matt: Nice. How much is this? Rabea: I haven't seen one of this in many, many years. Matt: Get to Andertons quick! Rabea: I had a point to make. Rabea: That point being that Pete Townshend uses, from what we can gather, you obviously got your Fender Strat, Fender style amplifiers whether it be old school stuff, whatever. Then, a couple of pedals like fuzzes, compressor, and a DS1 or something like that? We are talking minimal set up really. Matt: He's not an uber pedals guy. Rabea: With that in mind, I think we can extend our budget for a nicer guitar because I was going to say, obviously we can get this kind of thing [raises a Squier Classic Vibe Strat]. Matt: How much are these these days? Matt: Good idea, we can go higher than that. Rabea: Which we do, but this is a Squier. Maybe we could get a Mexican Strat, push the bar out a bit. Matt: I think we could, looking good. It's worth knowing that Pete Townshend's Strat has Lace Sensor pickups in it. Rabea: All right, well, that changes things. Matt: You might need to consider that. Well, this Fender Strat, is a Mexican Fender Strat '50s. Matt: Strat, and it's a maple board same as his. Matt: I think it just means that because of the difference in pickups we have to probably to do a bit more work with pedals but that's fine. Rabea: I think this is probably a good 'un. Matt: Let's do it. [scene change] We are in the land of Fender amplifiers. Rabea: Fender amplifiers as you can see by this nicely laid out podium style thing going on. Matt: There's a lot of them actually, more over here. Rabea: This is a giant wall of Fender. 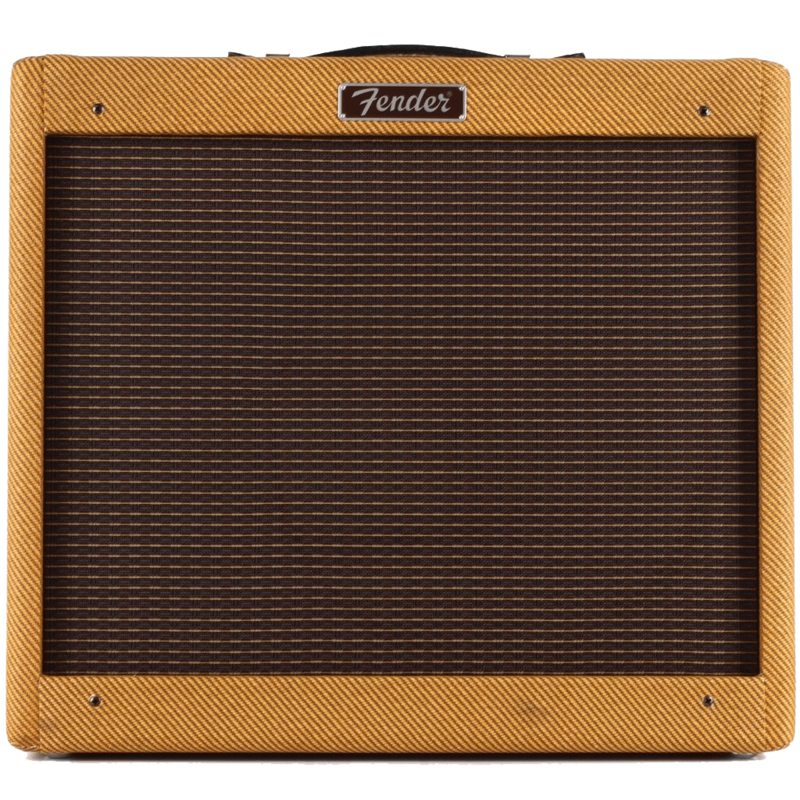 Matt: We have found this little chap here which is the Fender Blues Junior in a tweed finish. Matt: It should sound great with pedals. Rabea: It will take us up to about about 12, 1300 quid. Matt: The guitar is for 780. Matt: Oh, 716? Cool, fine, we're about 1270 then. We've got to get some pedals. Let's do that. Matt: We need some pedals. Matt: What do we think we need? Rabea: I've seen the OD-1, is very popular. Matt: Apparently, he uses that for more sustain. We have an OD3 here which about 89 quid, which would get us in that territory. Rabea: I take it we are using it as a clean boost as opposed to the tone of the pedal for the drive. Matt: Then we need a fuzz and a compressor. Rabea: We have the pedals. Matt: We've got some pedals. Rabea: We've also got the guitar, we got the Fender guitar, the Blues Junior, and these three bad boys. Matt: One, two, three, countdown. We got the Boss OD-3. 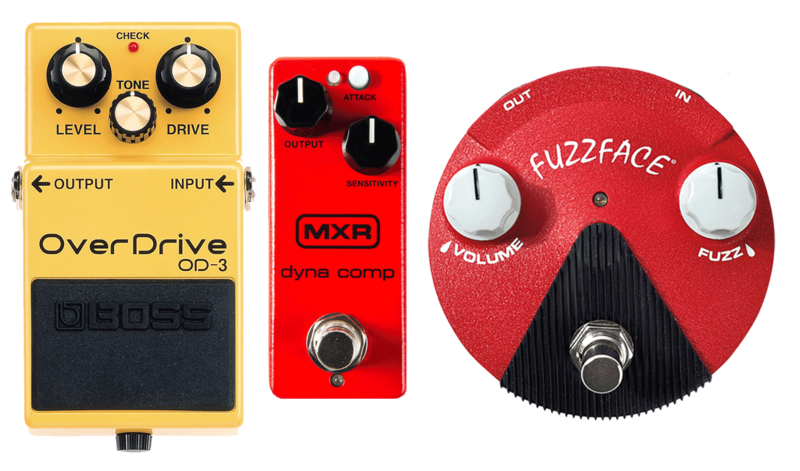 Rabea: We got the Fuzz Face Mini Band of Gypsys Edition - and a Dyna Comp Mini. Matt: All being well, this combination of things will make us sound like Pete Townshend. Matt: Yes, indeed we are in this magical mystery quest of joy and love to sound like Pete Townshend of The Who. Matt: The Who. Yes, those guys. Rabea: Basically as you saw in the store, we got a guitar, we got a Fender, we got a Fender amplifier, we got three pedals. First of all, we didn't use the Fuzz Face, we didn't find a place for it within the excerpts. Matt: That's not to say that it doesn't sound good. Rabea: No, is just that we didn't use it, let's extract it from the budget. Rabea: It has loads more gain. Matt: Huge, huge sound. Trying to find a bit of a middle ground or trying to find a sound that represents a bit of both was the challenge. Rabea: We danced between records and live versions, didn't we? On YouTube and Apple Music and all that kind of stuff. Rabea: We'll start with the old guitar, the old banjo. 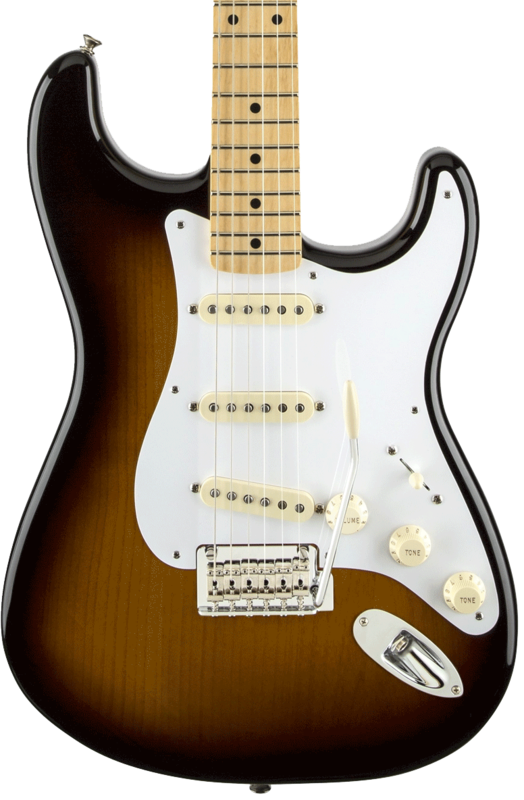 So, this is a Mexican Fender Strat, this is the '50s classic player. This is designed in the custom shop. Rabea: It's a nice guitar. Matt: Yes, a very nice guitar. Do you think it's Pete Townshend enough for us? Matt: Of the '50s specifically. Rabea: That lends itself to vintage tones in a respect of it being low output, back then they were all low output, you can achieve that. Rabea: That's the guitar, in a nutshell, is a Fender Strat. We're using the Fender Blues Junior and that's the tweed edition. Matt: Which is 15, one, one by 12. Rabea: It's pokey as hell. Rabea: But it's so loud. Matt: But it is, again, loud. Matt: I was going to say, because Pete Townshend's very famous for his lack of bass, treble & mids higher up. Rabea: We had to roll the treble and mids back down, bass is right up. Matt: We had to do the opposite because it's just so bright. Rabea: If we take off the pedals that we've and then we just give you the guitar and the amp. Matt: It sounds great though. Rabea: It's very, very, very spanky, which we don't necessarily want for the Pete Towshend tone. So, looking at pedals, Pete Townshend used the OD-1, we've got an OD-3. Matt: Yes, we've got an OD-3 which is as close as we can get. Again, it is probably more modern in his rig than the very, very old school days. Matt: I want to try to go compress the first one. Yes? Rabea: Let's go compress the first. This is without. [plays guitar] Then in. [plays guitar] Immediately tames that high-end, immediately. Before. [plays guitar] After [plays guitar] Gets rid of that high-end quite a lot, which I like. Matt: Well, let's try with the OD-3. Rabea: Okay, this is without the compressor so no OD-3. [plays guitar riff] It wants to do all that kind of stuff which is nice. It's driving it pretty hard, you can hear that the amplifiers going blah, blah, blah. Matt: - take more of a beating, yes. On the budget we have to make these compromises. We have the compressor as well, shall we try? Rabea: Yes, so without, [plays guitar chords] and with [plays guitar chords]. It's actually pulling a bit of output from the whole signal, but in a way it's taming it because we're getting rid of that brittle quality we don't want. It's giving us more of a rounded, just driven sort of sound. Again, we can boost the output on the MXR, but it's pushing the front end, so really, we should be turning the Master if we wanted to but we don't want to go deaf. This is how it sounds. [plays guitar] I think it's a fat sound. I think it's a rounded kind of sound. Rabea: [plays guitar] That's loud. Matt: Yes, that's really loud. Really hot. As you said no Fuzz Face. Rabea: We could show you what it sounds like though. Take off the OD-3. Let's not get ahead of ourselves Matthew, here we go. [plays guitar riff] It's just out there, isn't it? Matt: It's great and that should come across to you. It sounds huge. All out of this tiny, little thing. Rabea: Sounds like we're absolutely just just getting rid of all the stigma here. Matt: What's the master on here now? About halfway and the channel volume's only on about two. It's a very loud little box. Rabea: To summarize, I think what we're trying to do is try and get this sort of higher-end gear because of course when you're looking at vintage sounds and old-school artists, it's almost worth putting that little bit extra in the budget to get the higher-end gear. The tones are a little bit harder to achieve. You can't just get any old guitar and amp and pedal and hope that it's going to sound like old-school. Rabea: As proven with the Jimmy Page Sound Like, was really hard to do with just any gear. Matt: They tend not to have too many pedals in their rig. It's not a super complicated sound. Rabea: Which leaves you open to - there's a bigger margin for error like that. Matt: Yes, but also so having a really good bass components ie amp and your guitar is having better quality, probably is worth it I'd say. Rabea: Well, there you go. That is sound like Pete Townshend of The Who. Matt: Yes, it is. If you liked it, let us know. If you'd like to see us sound like other people, then also let us know. Rabea: Also, if you want to find out anything else about the gear that we've used in this video put all the details in the description box below and other than that it's all about liking, subscribing and sharing.